Junior Eli Hyatt talks skydiving, mountain biking, and climbing at Brevard. Hyatt remembers the first time he felt a calling toward extreme sports when he was 10 years old riding along in the car with his mother. “Looking up at the sky, I saw a parachute, and I immediately told my mom I was going to skydive one day. She responded with ‘Absolutely not Eli,’” Hyatt says. The junior integrated studies major (combining business and wilderness leadership and experiential education) has become more involved in skydiving, mountain biking, and bouldering since he arrived at Brevard College. He is a member of both the cycling and climbing teams, and he says that Brevard was the perfect place for him to explore more of his passions. After coming to Brevard, Hyatt was finally able to pursue that pull he says he always felt to extreme sports. In his freshman year of college, Hyatt made his first skydive. 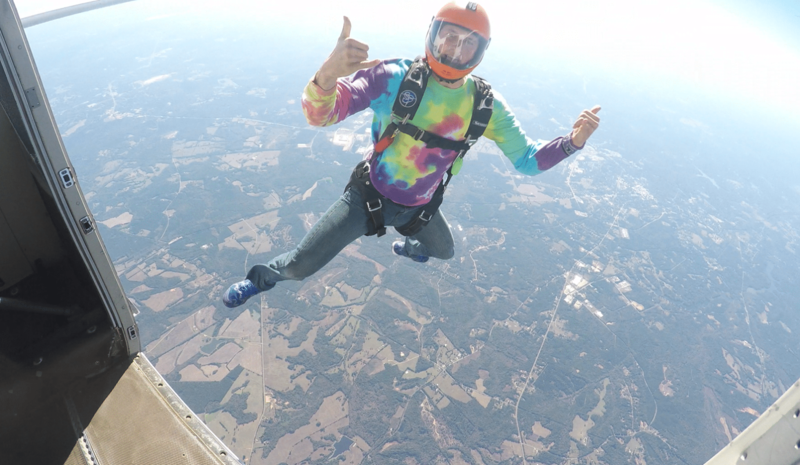 As of Sunday, Feb. 26, 2017, he had made 134 skydives with plans to start flying a wingsuit once he reaches 200 dives. Not only has he jumped into the skydiving community since becoming a college student, but Hyatt joined both the cycling and climbing teams after meeting a few similarly inclined adrenaline junkies who encouraged him to become a part of teams that competed in the sports he loved. In addition to riding bikes and jumping out of planes, Hyatt is also a member of the climbing team and likes to boulder outside of the gym. “I love the challenge a tall boulder gives me,” Hyatt says. He also plans to gain the skills necessary for big wall climbs. “Two- to 3,000-foot rock walls and sleeping on the wall definitely intrigue me,” he adds. It seems Hyatt is as accomplished as he is ambitious at pursuing extreme sports and challenging himself to take things to the next level in each of his disciplines. He left the basketball team at Brevard his freshman year to devote himself to improvement in these new outdoor endeavors. The key to his success? Precision. Drive and motivation are only a partial factor in his passions for these activities. For Hyatt, the community aspect of the sports has been equally important.